Being surrounded by a myriad of blooms and fragrant blossoms during the spring and summer months adds to the beauty of your landscape and is a relaxing way to spend an evening outdoors. When you want to relieve the stress that you may be feeling or the frustration from a project at work, there’s nothing like getting some plants, grabbing a bag of soil, and heading for the garden where your worries will melt right into the dirt. In order to have lovely combinations of flowers and plants you should take some time to plan the specific areas for planting first so that you’ll have a smooth flow and a gorgeous look. 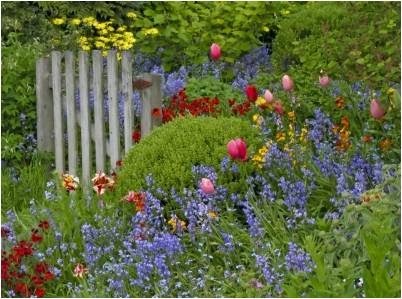 You can use the nearby structures like gates, rock walls, and old benches to enhance the overall appearance of your flowering landscape. Let’s see how to plan the planting that you enjoy and take great care in doing. It’s a good idea to consider all of the flowers and plants that you want to use, their heights, and the type of exposure that they need to thrive. Some of your plants will require shade whilst others love the exposed areas of your garden. Look through some catalogues during the winter months to get an idea of what appeals to you; it’s always exciting in the midst of winter to make plans for new life around your garden. Consider which colours will blend together nicely and how you can feature the vibrant plants that demand the attention of your guests. Be sure to choose some of your favourites and also keep in mind the type and amount of care that the various plants will need to live in your specific area. The next thing that you’ll want to do before you make any purchase is to determine the amount of space that you’re going to use for your plants. Will you set areas aside for special plants or do you plan to combine a variety of species so that visitors will get the full effect of the dramatic combination of colours and textures? Will you add new areas this year or maintain the same amount of garden space that you had last year? Adding new areas may mean additional work for you but it can add a blast of colour in a dark and dreary space beside your home. If you know how much area you’ll need to cover, you can better decide how many plants you’ll need and the types that you want to buy. Once you know the size of the garden area that you have and the plants that you want to use, you can map out which plants go where and how they’ll look together with other species. Be sure to vary the heights and textures of flowers and leaves to add interest to your garden. For some interest and as conversation pieces, you may want to include some Mediterranean plants that add a tropical flavour to your garden. Be sure that you follow instructions about how to plant and care for them properly. Gardening takes a great deal of planning and work to achieve the beautiful results that you want to have. But the work that you do now will certainly pay off with the fragrant blossoms and lovely flowers later in the year. This post is too nice.Good ideas are given in the above post.This above picture is too awesome.